With its Indiana limestone Classical façade, Old Indianapolis City Hall was intended to symbolize the stability and achievements of the city. Construction of the Federal Building in 1903–05 set the standard for new governmental buildings in downtown Indianapolis. City offices were housed in several different locations in 1906 when Mayor Charles Bookwalter called for consolidating them in a fitting building. Indianapolis architects Rubush & Hunter won the contract for the new building, completed in 1910. Four-stories high, with a veneer of Indiana limestone, the new city hall reflected City Beautiful Classicism. Engaged 2-story high Roman Doric columns gave the exterior its monumental character. The interior has a grand rotunda with stained glass dome. Gently knock on the columns; some are real marble. Others are scagliola, a kind of imitation marble made on plaster with special painting techniques. The circular rotunda extends upward three levels. 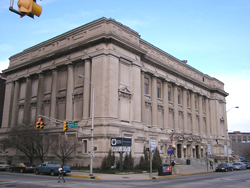 For many years, the Indiana State Museum occupied this building, after city government moved to the 1962 City-County Building. Located across Alabama Street, the Indianapolis Fire Headquarters and Municipal Garage was built in 1913 with additions in 1925. The building was constructed to house fire and police headquarters and equipment. Upon completion city services were consolidated within a single block of downtown. After the new Indiana State Museum opened in 2002, the Old Indiana City Hall was briefly vacant. The Indianapolis, Marion County Public Library system began work on a vast addition to the Central Library at that time. City officials turned old City Hall over to the library board to use as Interim Central Library until 2008. The building is vacant again and in need of a use. Old Indianapolis City Hall is located downtown at 202 North Alabama St. Old Indianapolis City Hall has been documented by the National Park Service's Historic American Buildings Survey.